In my day job, I consult with a wide spectrum of clients – CxOs, CIOs, Enterprise Architects and technology leaders. Besides discussing their technical challenges, some want to bounce ideas off me and discuss current trends I see elsewhere. During the past few months, the buzz on cloud computing has got louder, almost competing with another technology fad: Green IT. For business folks, excitement over Cloud computing seems to be on the TCO, and potential cost savings. For those of us in the industry, even with a few grey hair, cloud is yet another avatar of the earlier fads: E-Commerce, dot.com Hosted solutions, Application Service Providers, (ASPs), On Demand, Software as a Service (SaaS) etc etc. The cartoonist certainly has a dry sense of humor, implying an approach similar to my wife trying to drape a blanket over the clutter in our bedroom when we are expecting visitors. 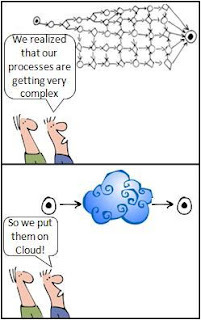 Abstracting problems to the cloud only shuffles the burden over to others, say a vendor, rather than solving it; a bad case of outsourcing if you will. It is interesting how IBM, HP and Oracle seem to be strengthening their position as a one-stop-shop when it comes to computing, offering hardware, software and services as a seamless service (a.k.a cloud?) to customers. While this happens, Offshore service providers - Infosys, TCS, Wipro - seem to be equally excited about the potential of Cloud computing. However, it is not clear if some service providers are merely tweaking their core service offerings – army of programmers offshore working on software solutions for western clients – to rebrand them as "cloud offerings". 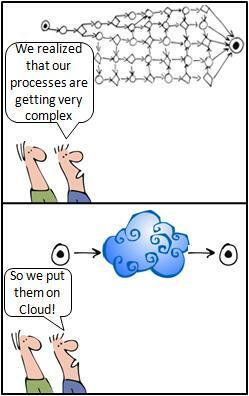 If one had a crystal ball, one would be peering to see if Cloud Computing is just a pie (or cloud) in the sky or actually an accumulation of thunder clouds that will produce monsoons.